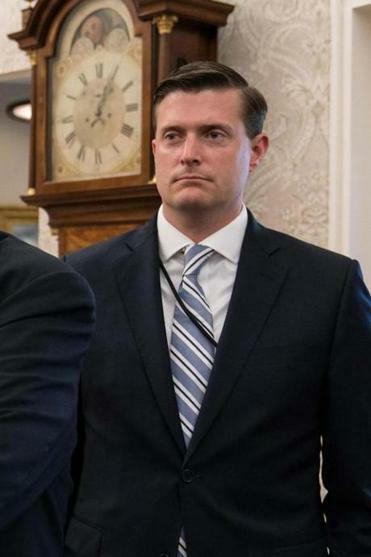 Rob Porter, White House staff secretary, is a key assistant to chief of staff John F. Kelley. WASHINGTON — Rob Porter, the White House staff secretary, announced his resignation on Wednesday, a day after his two ex-wives accused him in interviews of physical abuse when they were married to him. Porter’s decision to step down came after West Wing officials had urged him to remain in his job and offered a vigorous defense of him in the face of the accusations by Colbie Holderness and Jennifer Willoughby, his ex-wives, including photos of injuries Holderness had distributed. Porter added that he was grateful for the opportunity to serve in the Trump administration. He gave no date for his departure. A Belmont native, Harvard graduate, Rhodes scholar, and former Senate aide, Porter, 40, was widely considered a rising star by his colleagues and was an ally of John F. Kelly, the chief of staff, and a steady force in a West Wing populated by aides vying for face time with — and influence over — the president. The staff secretary is responsible for paper flow to the president, a particularly crucial job for a commander in chief who likes to get his own information from other sources. Willoughby, Porter’s second wife, did not respond to a phone call on Wednesday, but according to an emergency protective order she filed against him in an Arlington, Va., court in June 2010, she accused him of growing angry when she said he had violated a private separation agreement. A day later, her complaint said, Porter entered her apartment with a key he had not given back. According to her complaint, Porter left only after she had asked him to leave several times, and he returned minutes later and “punched in the glass on the door,” and tried to get into the apartment. He left the property after she read her name and address aloud to the 911 dispatcher. Holderness, Porter’s first wife, described their relationship as “verbally, emotionally, and physically abusive” in an interview with The Daily Mail. In photos she gave to The Intercept, Holderness has a blackened right eye and a swollen cheekbone. In a statement he gave The Daily Mail on Tuesday, Kelly, who in recent months has leaned heavily on Porter in his efforts to bring order to a once chaotic West Wing, called Porter “a man of true integrity” whom he could not say “enough good things” about. Asked what the president thought of the photos of Porter’s bruised ex-wife, Sanders said she had not discussed it with him. Sanders also declined to discuss specifics about Porter’s security clearance. Two people close to the White House said that Porter’s clearance was only temporary and that his ex-wife’s effort to get a protective order had contributed to the delay in granting him a permanent security clearance, a fact known to some West Wing officials for months. Congressional Democrats have been trying for months to get the White House to provide information about its security clearance process, including how many White House aides have been granted interim clearances because of issues that arose during their FBI background checks. Representative Sean Patrick Maloney, Democrat of New York, who served as staff secretary to President Bill Clinton from 1999 to 2000, called for the House Oversight Committee to open an investigation into whether Porter was allowed to access confidential materials without a security clearance, and whether Kelly had knowledge of the abuse allegations. “It’s unclear what kind of vetting process was followed in this case,” Maloney said in a statement. The White House had sent out several statements Tuesday evening supporting Porter, and officials coordinated one with Porter’s former boss, Senator Orrin G. Hatch, Republican of Utah. Hatch had described the remarks as “vile” smears and vouched for Porter’s character. But in a new statement on Wednesday, Hatch said he was “heartbroken” by the allegations against Porter, saying he had been a beloved staff member and trusted adviser.